Do you ever read sales copy and feel a tad overwhelmed? Some copy rambles on and on, without engaging readers; and when readers’ eyes glaze over or wander off, copy fails to persuade. It happens all the time. Bullet points are the perfect antidote to monotone, sleep-inducing paragraphs. When your audience reads bullet points while you speak, the bullet points distract from your talk. So, for PowerPoints, pictures are more engaging than bullet points with text. But in sales content, bullet points can be persuasive. People look at lists with bullets more often than lists without bullets (70% vs. 55%, respectively). And Lance Jones at Copyhackers found that improving bullet points on a sales page increased opt-ins with 25%. 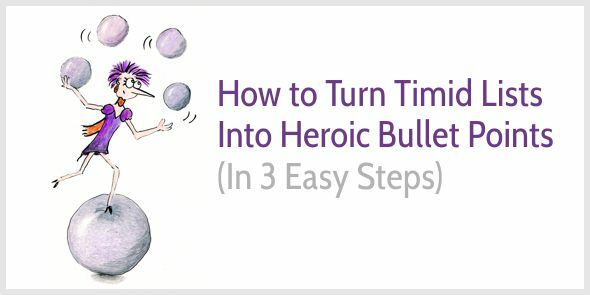 Want to learn the 3-step process for turning wimpy lists into target-hitting bullet points? The list above is messy and wishy-washy. It fails to engage and sell. Your first step is to add benefits to each bullet point. When you combine both features and benefits in your bullet points you instantly boost your persuasiveness. Remember, people don’t buy your product or service, they buy a better life or a better version of themselves. How does your product make them feel better? Note how the bullet points above follow the same pattern; each starts with a verb in the imperative form (plan, organize, chop, consider). Also, research shows that when you present people with a list of words, they’ll remember the first and last items most. Assuming the same applies to bulleted lists, it’s wise to put your most important points first and last. As human beings, we all have a desire to learn more. We’re curious. The curiosity technique on its own isn’t persuasive. First, you need benefits to connect with people’s emotions, then add features for substance, lastly use curiosity as a final nudge. Are you getting more interested in joining this cooking course? Short sales pages (for relatively simple or low-priced products) often include only one list of bullet points summarizing features and benefits. But on longer sales pages, use bullet points to (a) summarize key benefits at the start of the page, (b) consider highlighting features and benefits in a list in the middle of the page, and (c) sum up the offer at the end of the page. Longest Kindle battery life—the included leather charging cover can boost battery to months. Choose from a black, merlot, or walnut removable cover. This is the first bullet point. If your list items are complete sentences, or if at least one list item is a fragment that is immediately followed by a complete sentence, use normal terminal punctuation: a period, question mark, or exclamation point. If your list items are single words, very short sentences, or sentence fragments, you can choose whether to use terminal punctuation. The important thing is to be consistent. Finally, your text will be easier to read if you don’t put commas or semicolons after the items, and don’t put a conjunction such as and before the last item. All of these things are unnecessary clutter. If you find yourself wanting to format it this way, it probably means you should write it as a sentence instead of a list. The key for formatting powerful bullet points is to declutter and be consistent. To write sales-boosting bullet points, start with sneaking into your reader’s mind: Why would he care about buying from you? Which benefits are most important to him? What might arouse his curiosity? Once you understand the needs, desires, and secret wishes of your readers, writing compelling bullet points becomes a breeze. Keep it short. Be clear. And add a small dose of curiosity. Bullet points rock, both written and spoken. I think it’s the most effective way to communicate facts, features and things in general. As you say, not in Power Point, but the essence is to tell one thing at a time /slide. Also, I read again your article on how to turn features in to benefits. One of the best articles you’ve written in my opinion. Yes, I so know the guilty feeling of slow writing. In my experience, getting upset with being slow doesn’t help … it only slows me further down. What works best for me is to work in concentrated bursts of 25 minutes. I try not to think about results and how fast I’m going, I simply try to focus on doing the work. Stepping away regularly, even for a few minutes, helps a lot, too. It’s the speediest way for me to write. Thanks a lot for the insight on “declutter” and uniformity at the beginning of each point. Makes a huge difference in the flow of one’s content. Every time you write a post it’s like a master class. It’s fascinating to see the original cooking copywriting in your example transform. As I’m in the middle of working on some sales pages, this couldn’t have come at a better time! PS Hope you are enjoying Spain and have had some sun? Thank you, Kathy. A little polishing of your bullet points might get you a few more sales! Awesome idea. I like how you think each component of a blog post/sales page a s a different entity and work to optimize them. Like I never had given any special attendance to bullet points. There is so much to optimize them. I like the idea of first few and last few words catching attention of the reader. Seems interesting and I am dying to optimize my blog posts with them same. I do not have many landing pages/sales pages for optimizing but I am sure these optimization when done as you say will increase the charm/engagement and conversions of even blog posts too. Yes, you’re right – the idea of putting the most important points first & last also works for lists in blog post. And being concise and consistent also works for blog posts. Thank you for stopping by again, Swadhin. I appreciate your comment! Thank you for stopping by, Jeremy! Thank you, Henneke for another awesome blog. It is always a delight to read your writing. Thank you for your lovely comment, Kim. Happy writing! Great advice, thanks, Henneke. Love how you took apart the ‘offer’ how the service you provide will actually address someone’s wish/need and the dollop of interest. Also realized I tend to be more of a sentence writer. Lots to practise. Yes, that’s a good point… bullet points provide an excellent opportunity to practice writing fragments. This is really a great post. It came at the right time for my project. Thank you Henneke. Looking forward to another great post from you. Hi Sophia, I’m happy to read that this post came at exactly the right time for you. Happy writing! I love your poems, Carol! Would bullet points be good on an About page, listing benefits of the site for the reader or listing the writer’s personal skills? Or would that be too impersonal? I’m thinking the About page ought to be more chatty, like a letter? Yes, an About page is more chatty, so you won’t use a lot of bullet points, but you can still use them. On their pages, the bullet points don’t distract or interrupt the conversational tone. I love using bullet points. They help me convey messages in a logical way. I was interested to read about the punctuation for lists. I’ve seen the various kinds you mentioned, and I’ve often wondered what’s right or wrong. I prefer not to use any punctuation in a list. I also prefer punchy phrases rather sentences, especially those beginning with a verb as you highlighted. Thanks for the tips, Henneke! Yes, I’m with you – I prefer punchy phrases and no punctuation, too; that’s when bullet points seem most powerful to me. Good to see you again, David! I love your point #4 on perfect timing. It makes me happy when my tips are immediately used. Thank you. I’ve always liked the use of bullet points to de-clutter and simplify technical content. It can mean the difference between grabbing the CXO’s attention or getting a potential client to avoid my brand like a plague. But I never paid close attention to things like the structure and format. I’m glad that you found the tips useful. Thank you for stopping by! The bonus tip #1 about where exactly to use bullet points on a longer sales page vs a shorter one is excellent — so practical and concrete. And #2 about formatting — I like how you summed it up in one sentence “The key for formatting powerful bullet points is to declutter and be consistent”. I have also often hummed and hah-ed over whether to have ‘how to’ on every line, so the point about conciseness was a keeper for me. I can’t remember who it was, but someone once asked me about punctuation for bullet points and I didn’t have a clue. It seems everyone does it differently! The advice from the APA style guide seems to undermine the effectiveness of bullet points, so I quickly decided their advice didn’t suit me, and I was glad to find Mignon Fogarty’s commonsense approach. Thank you for stopping by again, Alison. I appreciate it! Fabulous article and I’m going to use your suggestions to beef up the results on my Leadership Confidence course and make them much more powerful for the women I want to attract. Thank you for this. LOVE the idea of including benefits along with the features. I think most people/businesses just want to write the features here, but I can definitely see how and why including benefits is game-changing! Thank you for your comment, Bree. Good to see you again! Visually, there is less clutter if you leave out the periods in a bulleted list. My own rule is always: less is better. So why punctuate? The bullets themselves are the punctuation. Ah.. the joys of talking about tiny things. But the tiny things matter, right? I enjoyed digging into the details of clutter-less bullet points and look forward to implementing these tips, so thank you! I think this sentence is absolutely true! Your customers do care about something, which is why they buy your product. Thanks for this great post,Henneke! This is the first time I visit your website and I’ll visit your website more often! I’m glad you enjoyed this post, Tony. Thank you for stopping by. Wow! On my way to work and I’ll have to finish your great article later, but had to say that just the first point made the light turn on in my brain lol! I was working on my bullet points early this morning and suddenly I can’t wait to get back to my computer later and FIX THEM!!! – You make me curious: what will I learn next time? For a newsletter I can only use a maximum of 40 characters to create a bullet. So … straight to the point. How can you write a short compelling bullet where you do the feauture-benefit-thing without losing that touch of curiosity? Do you mean the subject line or a bullet point? What’s its purpose? If you have more bullet points, then you can use one for curiosity, and another one for feature + benefit. If you have only one line, like for a subject line, then you have to choose what’s most important to communicate. What would make people click through? Often a specific benefit is most important. I meant the bullet points. I cannot use complete sentences like in your cooking class example. I have to keep it short and straight beacuse of the grid (max. 40 characters per bullet). That looks like a sensible recipe! Hmm, very interesting, Henneke. Who knows when that will come in handy. I just love learning, that is what this life is for me. Thanks again for that information, top class as always. Are you planning to write a non-fiction book, too, or are you doing fiction only? On a sales page for a non-fiction book, it’s quite common to have a list of bullet points explaining what you’ll learn and how you’ll benefit from your learning. The article is very informative. I enjoyed reading it.